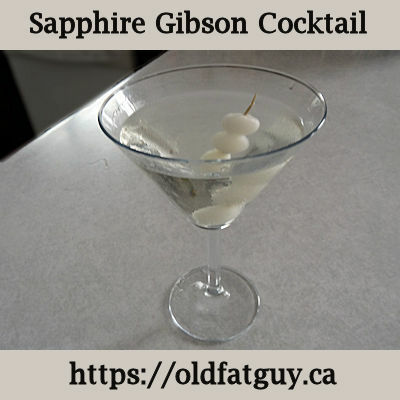 Martinis are great but have you ever tried a Gibson Cocktail? 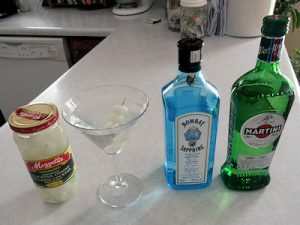 It is a mixture of gin and vermouth just like a martini but instead of putting olives in it, you use cocktail onions. Sounds like very little change, right? Actually, the touch of sweet and sour from the pickled onions gives a mild but significant change to the cocktail. I actually prefer the onions. Like a martini it can be made with vodka or gin. The important thing is to use a high quality liquor. I find Bombay Sapphire Gin is a good quality gin that isn’t a ridiculous price so I used it in my Gibson Cocktail and call it a Sapphire Gibson Cocktail. It is easy to make. Put 4 to 5 ice cubes in the cup of a cocktail shaker. Don’t use crushed ice. If you do, it will melt more quickly as you mix your cocktail and will dilute the cocktail. Add 60 ml (2 1/2 oz) and 15 ml (1/2 oz) dry vermouth. Stir until the cup is very cold, almost too cold to hold, about 30 seconds. You’ll note the cocktail is stirred and not shaken (take that James Bond) as shaking also makes the ice melt more and dilutes the cocktail. Put the strainer on the cocktail mixer and strain the cocktail into a martini glass that has been chilled in the freezer. Put 3 cocktail onions on a toothpick and stir the cocktail with the onions for a few seconds and then put them in the cocktail. Why three onions? Well one doesn’t add enough flavour and it is superstition that an even number of onions or olives in a drink is unlucky. I need all the luck I can get! This is a great cocktail. The gin gives some floral notes, the vermouth smooths it out and the pickled cocktail onions add touch of sweet and sour. A bonus is that a pickled onion soaked in a gin cocktail is delicious! Put the ice cubes in the cup of a cocktail shaker. Add the gin and vermouth. Stir for about 30 seconds, until the shaker is so cold it is hard to hold. Strain into a martini glass that has been chilled in a freezer. Put the onions on a skewer and stir the cocktail with them and drop in the cocktail.